When we left NYC to travel full time, we had a few destinations around the world that we knew we wanted to prioritize. One of them was India, and specifically during the Holi Festival. So many destinations around the world feel pretty heavily influenced by western culture, and we had heard that India was about as authentic as it gets- so we couldn't wait to get there and see if for ourselves! 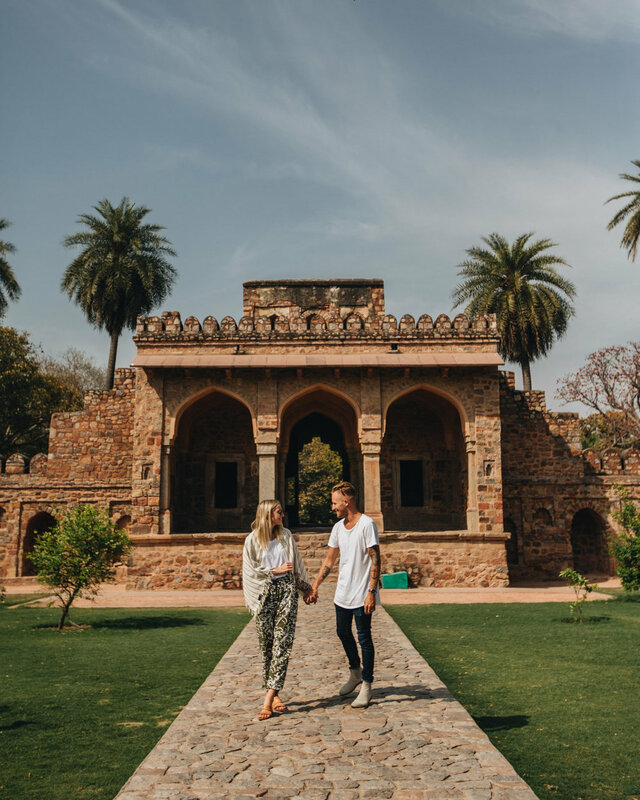 We partnered with India's number One airline, Jet Airways to explore a few cities in this incredible country, and we're so excited to share our India Travel Guide with you! We only had about 10 days to spend in India between a few jobs, so we decided to spend all of our time in the area called "The Golden Triangle" in the North. It's made up of Delhi, Jaipur and Agra, and is a pretty standard circuit for people visiting India as there is so much culture and must-see destinations packed into the area around these 3 cities. You can travel between each city by car, but we had a mix of flights and hired drivers, which we thought was a good mix. Jet Airways flies all over India, and we had a consistently good experience with them each time (You can read our full review of Jet Airways here). Most countries will need a visa to visit India, and you'll want to plan ahead as it takes time to process the visa. It's a bit of a complicated process online, but we applied for the E-Visa On Arrival about one week before we left, and needed to bring our printed approval letter to the airport to board our flight. The approval came in our emails 2-3 days later. It cost us about $75 per person and we paid online with our application. Once you land in India, you proceed to the Visa On Arrival counter and get the official stamp there (again with the necessary approval letter) and that's it! We applied for our e-visa here. India was truly one of the most beautiful, epic places we've ever visited. You see things that you don't see anywhere else like cobra charmers and exotic Rajisthani palaces and camels and cows and elephants in the streets. The sunsets and sunrises are hazy and pink and pure magic, and the food is insanely good. It was also pretty challenging- we felt that we had to be on guard all the time, and as a non-indian a lot of people try to trick you or rip you off (like almost anywhere you travel in the world). It's sensory overload and a bit of culture shock, and after 10 days of waking up at sunrise to explore until late at night, we were ready to get back to something more relaxed and familiar. During our time in India we were shooting lookbooks and social content for 11 fashion brands as well as working with multiple hotels and travel companies, so our experience was quite a bit more full on than most. 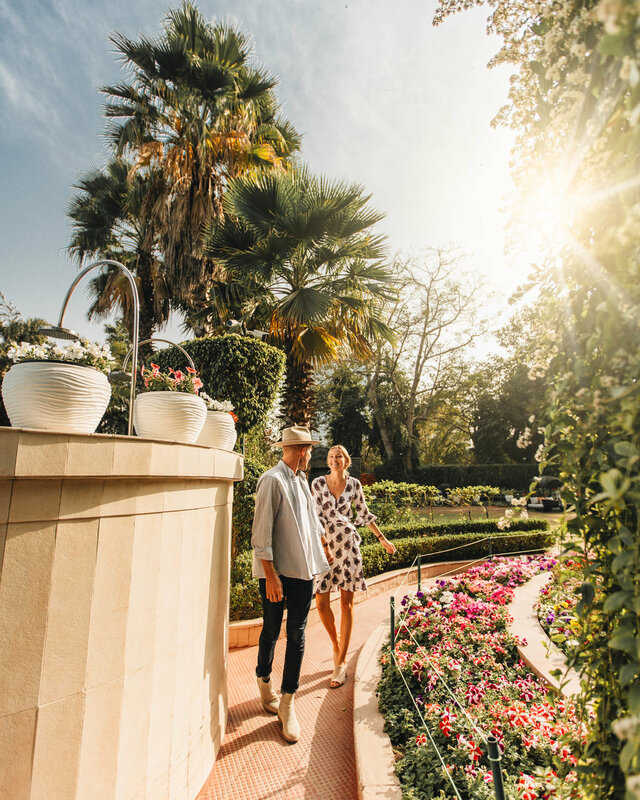 If you can take it a bit slower and really enjoy your time in each destination with some built-in time to rest and refresh, we'd highly recommend it. We've broken our guide through the Golden Triangle up into our 3 locations in the order we explored, and tried to give you as much info as possible. Let us know if you have anything to add in the comments below! Delhi is the capital in India's North, and the geographical top of the Golden Triangle. This bustling, crazy city is divided into Old Delhi (the walled city established and built during the Mughal Empire in 1638) and New Delhi (built during the British Occupation in 1911). We loved it for the amazing history and good public transportation, big-city feel and amazing North-Indian food. Red Fort- Delhi's Red fort was built in 1639 and served as the primary residence of the emperors of the Mughal dynasty for 200 years. There is so much incredible architecture to see inside of this heritage site!! The grounds themselves are huge and there’s unlimited amounts of photo opportunities everywhere you turn. It does tend to get pretty crowded so if you are planning to shoot here, we would suggest the earlier the better. That goes for pretty much any iconic spot in India. All of our best shoots were at sunrise, which is easy to do when every sunrise is as beautiful, hazy, and magical as they are in India! We went to the Red Fort during midday and it was really hard to get a good shot, but the good news is that the lighting at sunset was absolutely stunning! Qutub Minar- The Qutub Minar is a UNESCO World Heritage site constructed in 1192, and is one of the earliest surviving Mosque complexes in the India subcontinent. It was stunning! The minar itself was quite striking but we found the entire complex mesmerizing and beautiful. We visited and shot around 10am or so and it wasn't too crowded, so this would be easy to do after a sunrise location if you're putting together your own itinerary. Humayun’s Tumb- The tomb of Humayun is another UNESCO World Heritage site, constructed for the Mughal Emperor Humayun in 1569-70 by his first wife and chief consort. There was literally SO much to see here… it gets really crowded so plan to go early, but it is really large and really beautiful! We didn't even make it around the entire site because we were so hot and tired by the time we got there, so plan for this one to take a bit of time, but it is totally worth a visit! Safdarjung Tomb- Okay, Humayun’s Tomb is more famous, but we actually much preferred our visit to Safdarjung's tomb! It probably has a lot to do with the fact that we got here at sunrise so we had the entire place to ourselves for over an hour, but it was such a beautiful place to be for sunrise and to get a wide variety of shots with no interruptions! This striking Mausoleum is made of sandstone and marble and was built in 1754 for the Mughal Empire statesman Safdarjung. So many people thought our photos here were at the Taj Mahal, because the silhouette in the glowy morning sun looks pretty similar! This place was definitely one of our favorites in New Delhi! India Gate- The India gate is a war memorial built to memorialize the 70,000 soldiers from the India Army who died during the first world war. Get your iconic gate shot here (along with everyone else in Delhi…) but do keep in mind that it does light up beautifully at night too so if you want a good night shot or even just a good spot to hang out and see the starts, this is your spot! The surrounding lawns are the perfect place for a picnic lunch as well. We were told that a lot of locals park their cars here at night with their friends and drink a chai (chai's are a staple in India, and the most amazing we've ever tasted). Sounds pretty magical, right?! Rashtrapati Bhawan- This is the parliament and the president’s house! It’s right across from the India Gate and so it's super easy to see both in about 30 minutes or so. We didn’t really shoot here at all, but we were glad we stopped by to have a look. Worth seeing, but if you're pressed for time, this one would be probably be the first place we'd take off our list. Jantar Mantar- Jantar Mantar is an equinoctial sundial built in the early 18th century, and another UNESCO World Heritage site. The sundial is intended to tell the time of day and is accurate to half a second, amazingly. This was the biggest and most extravagant sundial we'd ever seen, and it was so cool! There are countless angular shots to get here, with beautiful shades of tan and red all over the place. There is an identical sundial in Jaipur as well, so just do one or the other! No need to see them both. Chandi Chowk- This local shopping market district in Old Delhi will really give you an authentic feel of Old Delhi! It was chaotic and dirty and everything you’d imagine it to be. It was definitely a really cool cultural experience that we wouldn't miss when visiting Delhi. We were so happy to have the experience, and then happy to hop in a Tuk Tuk and get the heck out of there! Haha! **Lodi Gardens/Garden of Five Senses- Apparently makes for such a gorgeous walk! There are so many unique flowers all over India, we are sure it must be so gorgeous! **Gurudwara Bangla Sahib- This is a beautiful temple that seems to be a favorite in Delhi. Radisson Blu in Connaught Place- Honestly, we booked this place super last minute… as in we booked it at the font desk of the hotel after arriving in New Delhi from the airport, haha! We were waiting for a few confirmations from other collaborations so we pushed this booking until the last minute. The hotel was fine, it was super affordable and in a pretty good location, but it wasn’t anything special. If we had done a bit more research, we would’ve probably stayed somewhere else, but it had everything we needed— even a gym and a balcony! The balcony was really nice to work from, and we enjoyed being in a central location to be able to walk to dinner each night and have plenty of options to choose from. Connaught Place Restaurants- One of the benefits of staying in the Connaught Place area was the unlimited amount of restaurants. We only had to walk a few minutes in any direction from the hotel to find some incredible Indian or International food- so if you find yourself in Delhi and don't know where the happening place to eat is, ask the cab driver to drop you in the middle of CP and you'll find anything you want! Shang Palace @ Shangri-La Hotel New Delhi- We went for a dim sum lunch one afternoon to Shang Palace at the Shangri-La Hotel, and it was an incredible fine dining experience from start to finish. We were glad to have the break from Indian food, and It was one of the best dim sum meals we've ever had! If you're looking for a beautiful lunch or dinner option while in Delhi, we loved our experience here and highly recommend it! You can easily get around Delhi via Uber or on local Tuk-tuks, but if you go the local route make sure you agree on a rate before getting in. If you're looking to explore for a day at a time with minimal stress, you can book a driver by the day instead. In Delhi, we booked our drivers for the day through a company called India Tourist Driver, which you can check out Here — they were great! They have drivers located all throughout the entire golden triangle ((New Delhi + Agra + Jaipur)) and if we went back, we would go through this company again for sure. Make sure you negotiate a price including all parking and tolls- and you can haggle a better deal if you book for more than 1 day. This company was the most professional one we used, and highly recommend it. We used them 2 full days (8 hours each day) and worked out a price of 2800 Rupees for 2 days including all tolls and parking. Our Favorite: Our favorite thing about Delhi was experiencing so many stunning heritage sites! They were all so different and unique, and everything was pretty close to each other so it's easy to pack a lot into each and every day. As mentioned previously, our best days were the ones that we woke up early to shoot at sunrise at our top locations because Delhi is a very busy and crowded, so shooting those iconic shots that are all over Instagram in these places came with many challenges. But the whole experience of seeing such ancient, culturally rich places was truly amazing! Our Least Favorite: As you could imagine, two blonde-haired, blue-eyed people with camera gear and outfit changes stood out like sore thumbs in India. That meant quite a lot of stares, and lots and lots of people asking us for selfies. It was endearing to a point, but it got a little tricky to go anywhere in public without being stopped every few yards. The people in Delhi were entirely lovely and we met a lot of incredibly kind souls, but we also had multiple instances of people pulling us to take a photo when we politely declined or following and photographing/videoing us after we asked them not to. People followed us on the streets and while we never felt unsafe exactly, we often felt very uncomfortable. It was a little overwhelming, and we felt like we needed to have our guard up at all times (especially Tara), and we were a bit relieved when we left for the smaller, less crowded, more relaxed city of Jaipur. Jaipur is the capital of the Indian state of Rajasthan, affectionally dubbed "The Pink City" because of the color of the stone used to build the original walled city in 1727. We loved it for the beautiful Rajisthani culture and influence, the gorgeous architecture and the kind, relaxed people. Patrika Gate- This is one of India's most famous and instagram-worthy gates— it's a beautiful pink + gold building with the ornate and extremely colorful inside. This recently built gate is the 9th gate of Jaipur, the 2nd addition to the 8 original gates of the city. We could not wait to shoot here because it is unlike anywhere we had ever shot before! The first time we shot at sunset and it was super crowded, and then we came again at sunrise… also crowded, haha! I think it might be a bit impossible to avoid the crowds here, but definitely still make the effort for the shot because people kind of take turns at shooting on the inside and when you finally do get the shot, it is so worth it! This place is so unique! It's about 20 minutes from the center of the city (closer to the airport, the opposite direction of the most famous forts etc), so plan accordingly. Also, Zach fell backwards off a ledge here white trying to get a shot, so be careful around those knee-high fences that border the small balconies, haha! Hawa Mahal: Palace of the Winds- This incredible, unique palace was built in 1799 by Maharaja Sawai Pratap Singh right in the middle of The Pink City, and it is such an incredible site to see! Rumor has it that the Maharaja had his lead-architect's hands chopped off after completion so he could never replicate the style anywhere else! You can pay for a ticket to go inside, but we heard that there wasn't much to see inside and the shot everyone wants anyways is of the palace itself from the outside! There is a cute little cafe directly across the street called ‘Wind Blown Cafe’ that has incredible views of the entire Palace! And better yet, there is a guy named Mojito who works here who is so nice + friendly. If you see him, tell him Zach and Tara from New York said hello! We ended up coming back to this cafe multiple times just to hang with him. Good coffee, good view, and good company-- the absolute best! It's a sort of tricky entrance from the street, and you have to take 2 or 3 flights of narrow stairs to get up to the cafe. Ask any of the guys on the street if you can't find it, and one of them is likely to be part of the family that owns it. Amer Fort- Amer Fort is located about 11 kms from Jaipur, and was originally built in 1592. It is another UNESCO World Heritage Site, and it is stunning and iconic for every good reason. The exterior of the fort itself is amazing, but you can also buy a ticket to tour the interior of the fort to see the most impressive parts of the Palace. While we don't support elephant rides, one of the ways that people get up to the fort is on elephants- so if this is something you avoid entirely then just letting you know that it is one way that people see this site. The Amer Fort itself is gorgeous to see, but we also spent one morning hiking up to the fort's original wall/gate on the hilltop across the road, and that was probably our most magical morning in Jaipur. One side looks down on the breathtaking golden Amer Fort, and the other side looks down over the city of Jaipur as the sun rises over the mountains in the distance. The hike itself was pretty intense and took 15-20 mins or so straight up the ridge on a ruthless set of stairs, but worth every rocky ((and steep!)) step. You're able to have such a beautiful view of Amer Fort from the top as well as the entire Pink City. It was truly breathtaking and we highly recommend doing the same if you are up for the adventure! It was one of the most incredible sunrises we have ever seen- and major thanks to Puneet Yadav for the recommendation! City Palace- Jaipur's City Palace was built for the Maharaja of Jaipur in 1729, and is another must-see spot when coming to Jaipur. There is one option for 500 Rupees for general public ((about $8 USD)), which allows you to come inside, see the main courtyard area and a beautiful peach and white room, and that is about it. There is another option to pay 2500 Rupees ((a little over $38 USD)) that allows you to view a LOT more of the palace (including a really epic blue room that we were really dying to see!). We only did the cheaper option because we weren’t sure if it was worth the price difference and we had already shot so much at that point, however we regretted it because we didn't end up having time to go back and have a look and heard that the price difference is totally worth it! It will be at the top of our list for next time…!! We used Uber almost our entire time in Jaipur- it was fast, easy, super cheap and very reliable. We still used a day driver a few times and recommend India Tourist Driver again, unless you can find a reputable local driver. We hired a local driver, and while it was a fine experience, we did end up with a few headache situations that we were able to avoid in Delhi by booking through the company. 1st Airbnb — We stayed with such a sweet family ((mom, dad, and daughter)) who treated us 100% like their own! We shared meals with them and really felt like we were a part of the family! They were so kind + helpful in explaining their beautiful country to us, and we were so thankful to have such a warm and local experience. It was just what we always hope for when booking through Airbnb, and definitely recommend their rooms if you're looking for a local experience in Jaipur. CLICK HERE to book your stay with Raman and Kavita! 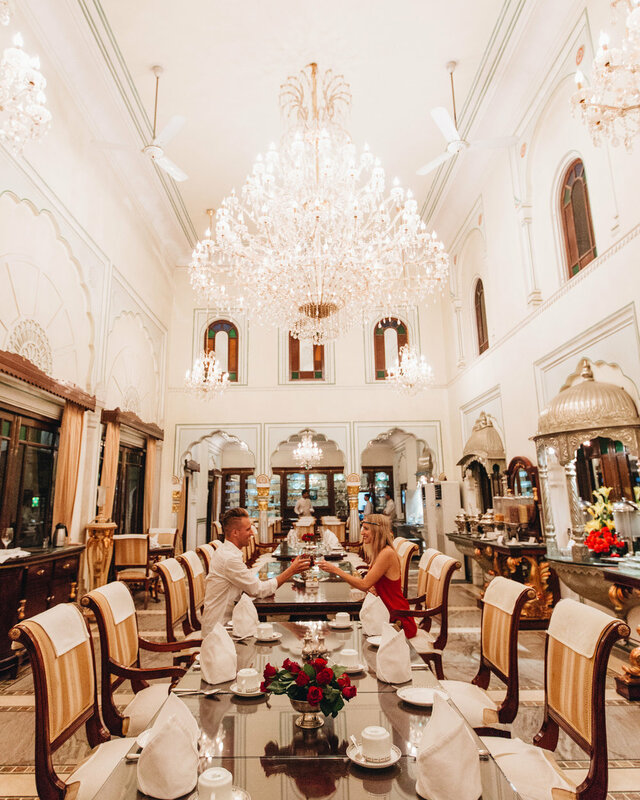 The Raj Palace— This place was probably the most luxurious experience we have ever had, hands down. 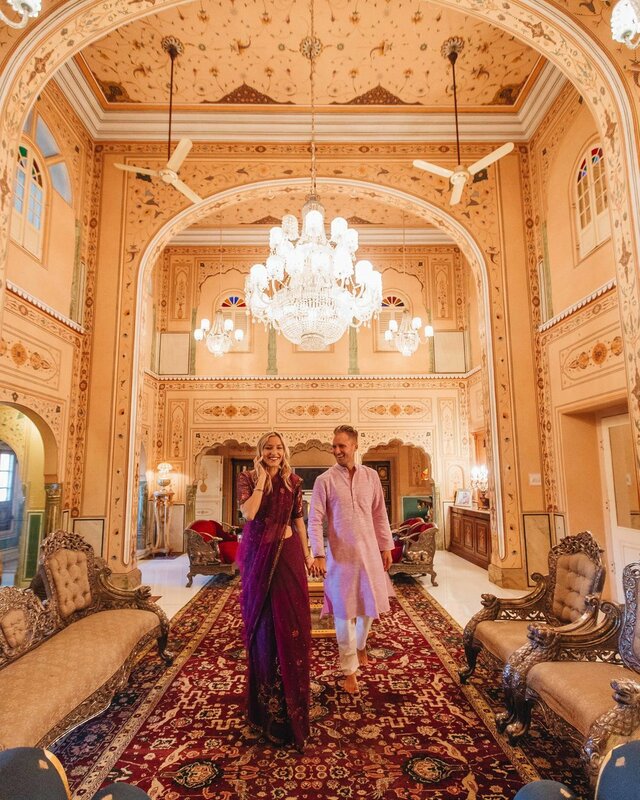 We still are pinching ourselves that we stayed in an actual Indian palace for a night-- it was a dream! It is a 300 year old Rajisthani Palace converted into a hotel... talk about ultimate Indian luxury! The staff all look amazing and wear the coolest traditional outfits. There are numerous courtyards that each look as if they are scenes painted from a storybook. Our room was gorgeous in every way, and only having one night here was just too short. Our dinner experience here was so epic, and we felt like true royalty the entire time. If you are looking for a culturally luxurious experince while staying in Jaipur, look no further. CLICK HERE to book your stay at the Raj Palace! 2nd Airbnb — For our final night in Jaipur, we stayed at another Airbnb- this time of a friend and fellow photographer we had met on Instagram. We'd spent a morning with him shooting in Jaipur earlier in the week, and we were to happy to stay with his family for our final night in India. 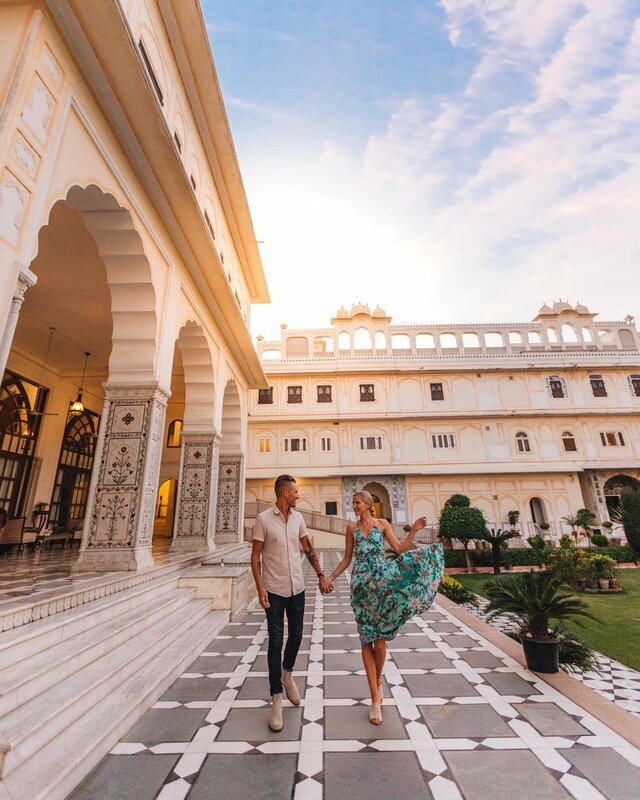 Puneet knows all the best local spots in Jaipur and is an incredible photographer himself- so we'd definitely recommend hiring him to show you his version of Jaipur even if you don't stay a night at their place! Contact him via Instagram to see if he's available when you're in town, or CLICK HERE to book your stay with Puneet Yadav! 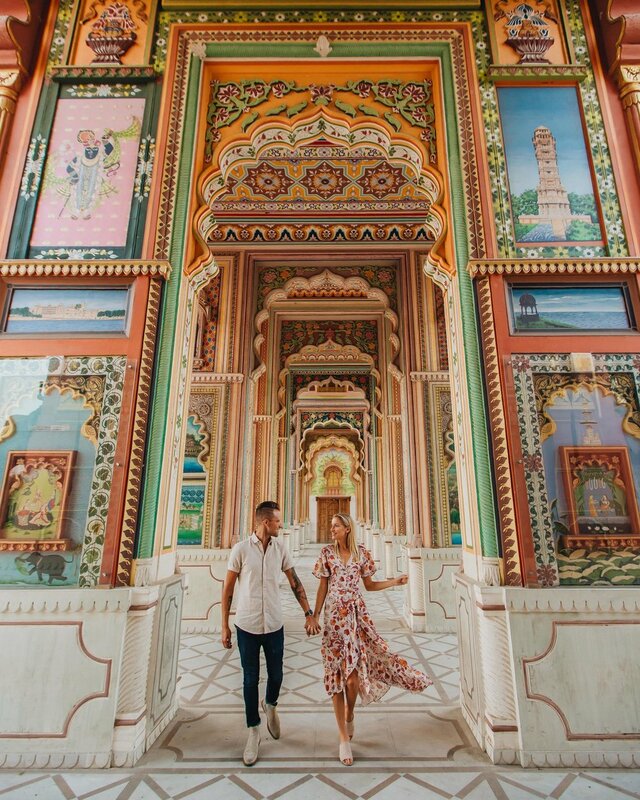 Our Favorite: There were so many favorites about Jaipur… We went to a shop near our guesthouse that our hosts recommended and bought traditional Indian clothes! Tara picked out a Sari and Zach picked out a __. It was such a cool experience that we will never forget. The place had such nice quality goods for affordable prices, and the staff were helpful and kind to help you find exactly what you were looking for. We loved it! Our last night we ate at an incredible rooftop restaurant called Peacock. We highly recommend checking it out for your time in Jaipur. There was live music and good vibes, what more can you ask for? Taj Mahal- Our visit to the Taj Mahal was the only reason that we went to Agra and we only planned for one night so we could make sure to go first thing in the morning before sunrise. We knew that the Taj was going to be beautiful to see, but it was far beyond what we could have even imaged! It is one of the 7 Wonders of the Modern World, and it was stunning in every way!! We arrived at 5:45am and surprisingly enough, there was already a large line to get in. The doors don't open until around 6-6:30am, and then everyone rushes in to get the perfect shot. Most people stop to get the iconic shot straight on, but if you book it straight to the mosque on the west side of the Taj, you can hopefully score a little time with no one around like we had! The Retreat- This hotel was fine, kind of similar to our experience in Delhi at Radisson Blu. Took care of our basic needs, but nothing special and pretty affordable. We were only there one night so it was perfect, and super close to Taj Mahal. The breakfast was actually pretty good and the staff were really friendly! It was nothing fancy, but we wouldn't mind staying here again if we needed to. CLICK HERE to book your stay at The Retreat. Our Favorite: All we planned to do in Agra was go see the Taj Mahal, and there is nothing that could top that experience. It was absolutely everything we could have ever imagined + more! It was beautiful in every way, and totally worth the drive from either Delhi or Jaipur to see it for yourself! 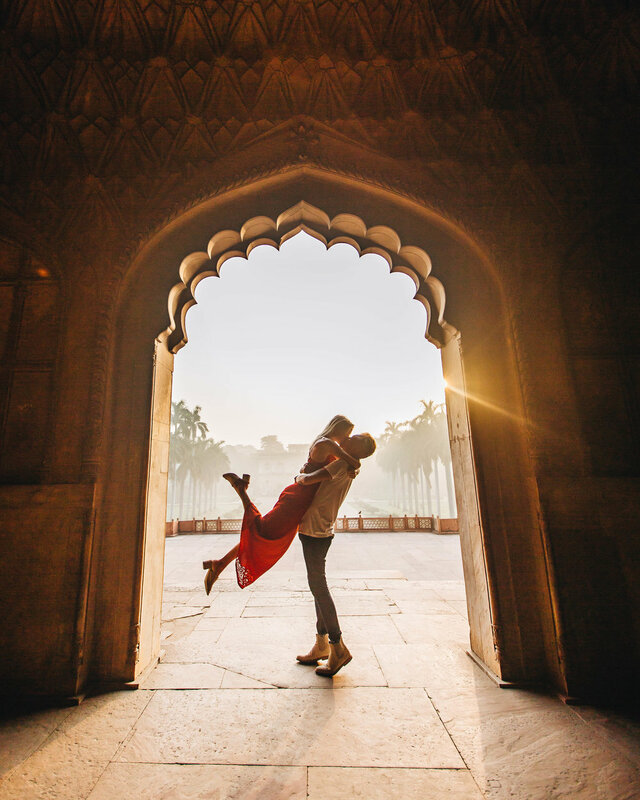 We shot from the west side which isn't as popular as the east side, but we preferred the lighting because the sun rises from behind the Taj and it made for some incredible photos- without the large crowds!! Enter from the western gate for a smaller crowd, and we took a tuktuk inside to a secondary closer gate to get in faster once it opened. You can technically walk to that gate, but we didn't mind paying a few dollars to ride and get ahead of the crowds. Our Least Favorite: We felt like we always had to be very vigilant to watch out for ourselves in Agra as everyone is trying to sell you something or make a few bucks off of you. As you can imagine, millions of tourists visit Agra each year for the Taj Mahal, and any highly-tourist site can be like that. Like we mentioned before, our driver situation wasn't ideal. We were kind of forced into having a guide for the Taj Mahal because our driver told us it was a “pick-pocket area” and that the guide would be coming with us and it was already included in the price we paid for the drive. We tried telling him that we didn’t need to have a guide, but he didn't speak english too well and basically told us over and over it was already included in our price. However, this was not true and actually the guide tells you you can pay whatever you see fit— which of course makes you feel bad if you don't pay him well! It was a pretty uncomfortable situation because we felt obligated to pay him even though we didn't ask for his services whatsoever. After having had him along, though, we were happy to have a guide so he could explain things to us and he even offered to shoot photos of the two of us (tripods are strictly prohibited in the Taj!) so it is something we would have been up for anyways. It was just a bit sketchy how it all unfolded and we want to make you guys aware before it happens to you too!! ;) You can definitely do the Taj Mahal with no guide, and we probably would have- but in the end we'd recommend a guide if it's your first time. It helps with navigating the crowds, the craziness, and they can help with photos. Just discuss price and have everything on the table beforehand! One thing we’ve learned in India is that nothing is free regardless of how many people offer you a ‘free’ service. This is the case in many places in the world of course, but we were faced with this over and over in India. Knowing it ahead of time and being aware is important and helps you to know what to expect when traveling here! Having said that, we met some of the sweetest people in India — our hosts Raman, Kavitah, and Puneet-- and were so thankful for the many things they did for us selflessly during our stay. All in all, we were completely in love with India. It was unlike any place we have ever been, and the culture is rich and beautiful and exotic. The architecture is stunning and unique, the food is amazing, and we shot some of the most amazing photographs we have ever shot! There are some things we would change if we did the trip over again, but all in all we feel extremely lucky to have seen the places we saw. After 10 days of full-on shooting and exploring, we were ready for some down time and familiarity- but we'd recommend a trip to India's Golden Triangle to pretty much anyone! Life Update: Come Away With Me To India, Singapore, Thailand, and Indonesia!